The French are not yet en accord with the British habit of shops opening on a Sunday. Unless you live in a large town with the occasional open shop, the best you are going to do is an early morning croissant from the boulangerie. Need a litre of milk? Non, nous sommes fermé! Isle sur La Sorgue market some 25 km from Avignon is therefore something of a natural mecca for tourists on Sundays. Compared to its sleepy neighbours, the small town provides an assault on all the senses. Bustling traders call out their wares. Granted this is not somewhere that you are likely to do your weekly shop- prices are a little on the steep side- but the provenance of the food is unparalleled all hailing from and marked proudly with the names of neighbouring villages. 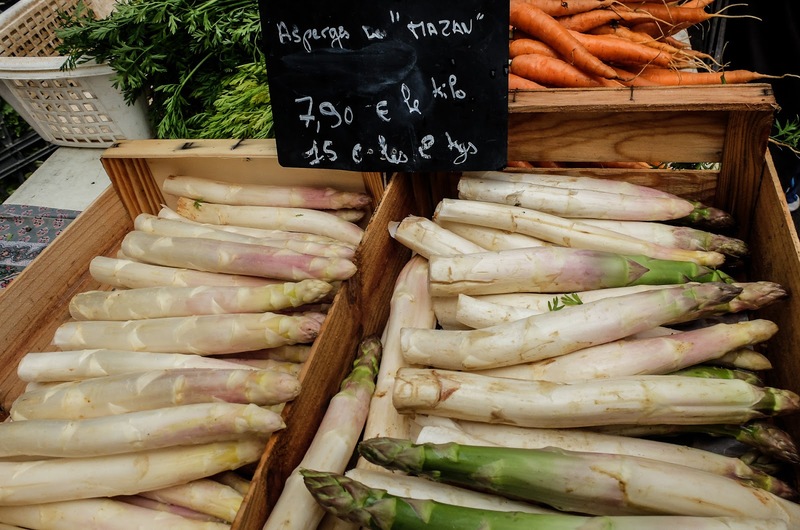 Strawberries from Carpentras, chunky white asparagus from Mazan; both under 20km away. It would be a travesty to come here with a cold as your sense of smell is very much in for a treat. I am convinced you could be led around blindfolded and know exactly what was being sold. 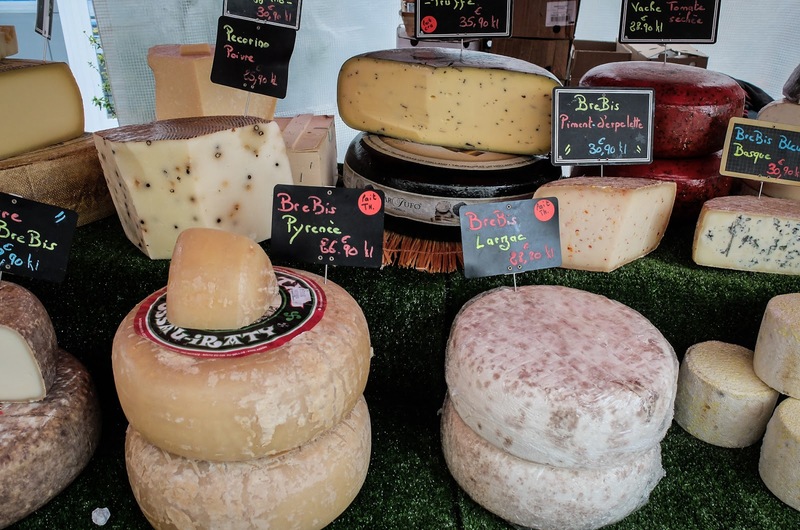 Wheel after wheel of cheeses with a tendency towards goat are laid out on multiple stalls. 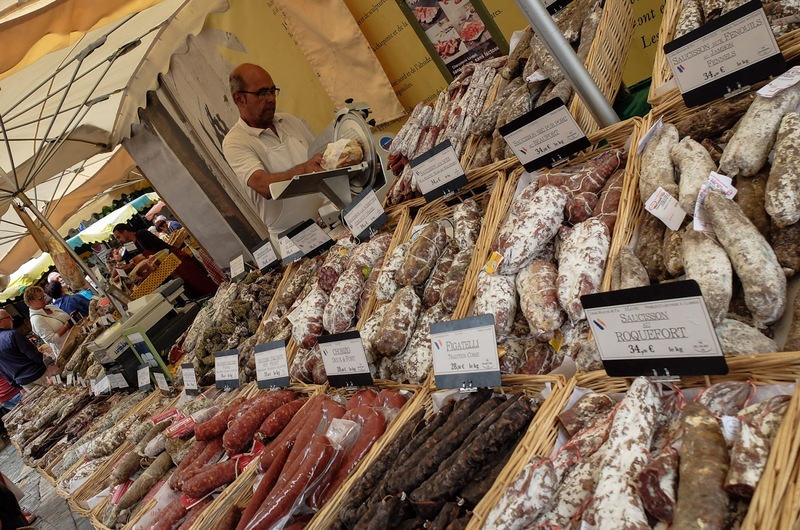 The presence of a multitude of cured meats in a French market comes as nothing of a surprise but what was more unexpected was the wide variety of less than traditional flavours. Donkey sausage anyone, or bull? Some stalls had in excess of 30 varying flavours from over 10 different types of beast. Of course every market in France has saucisson and cheese; that is stating the obvious. 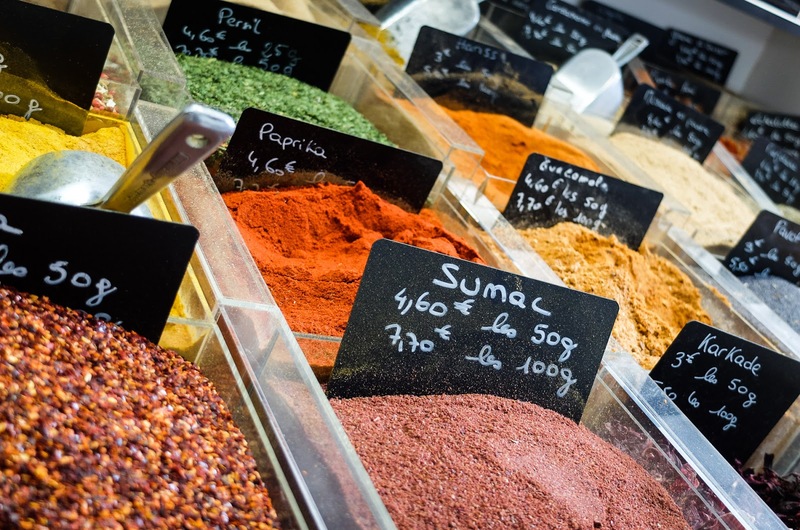 But what makes this market unmistakably Provencal in my opinion are the presence of four things. 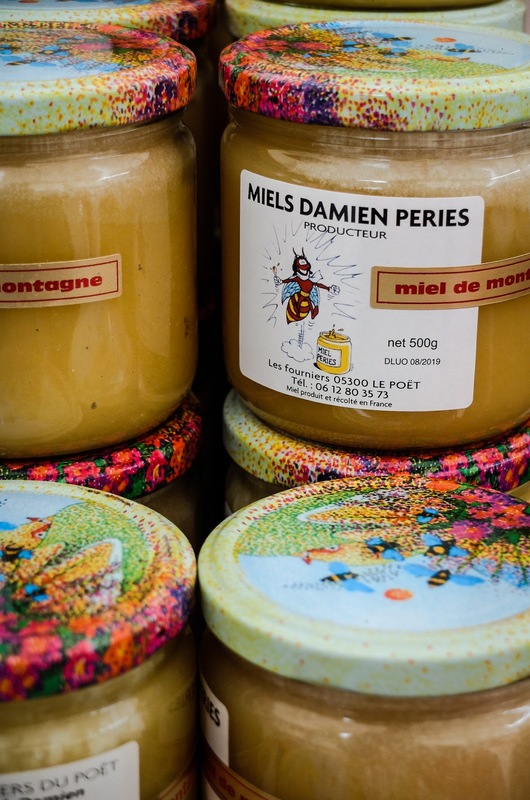 Firstly the beautiful golden honeys that take their distinctive flavour from the garrigue on the hillsides and the endless fields of lavender. Not cheap at around £10 a jar but utterly delicious. 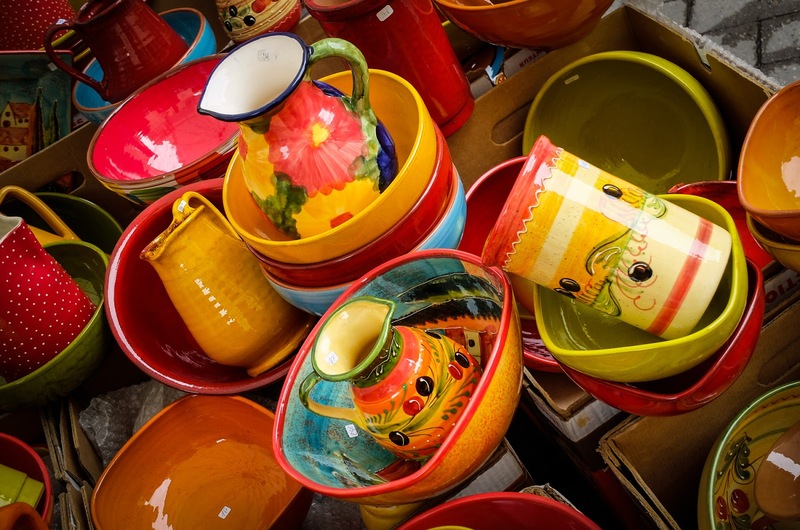 Brightly coloured pottery adorned in reds, umbers and blue with olive branches a go-go cry out to be filled with rosé wine and salads to adorn our picnic tables on those few days of the year when we can dine reasonably outside. 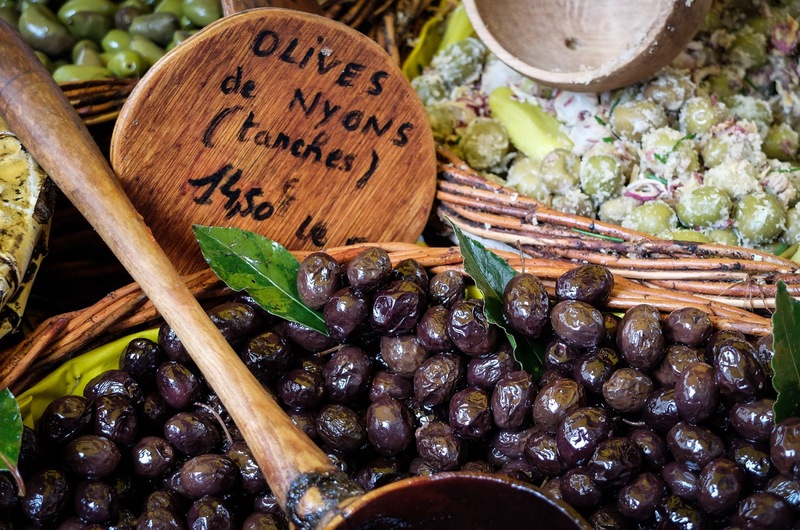 Many stalls offer pots of tapenade in every conceivable shade of pale khaki green through to the blackest of black depending on the olives used. Alternatively, buy the fresh olives and whizz up your own in the processor when you get home with capers, garlic and a few anchovies- the easiest of home made canapés. 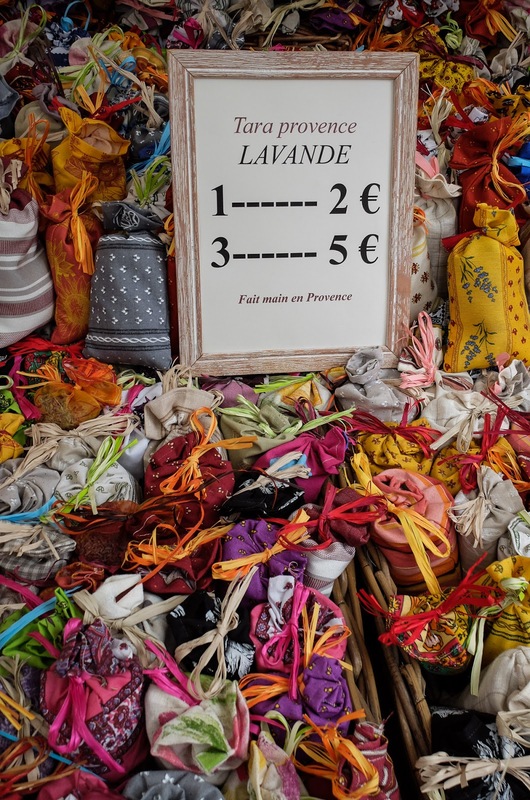 The other aroma that pervades the air is lavender offered in every possible guise from soap to little bags to an array of beauty products. Surely field upon field of bright purple flowers is what many of us conjure up when we think of Provence? 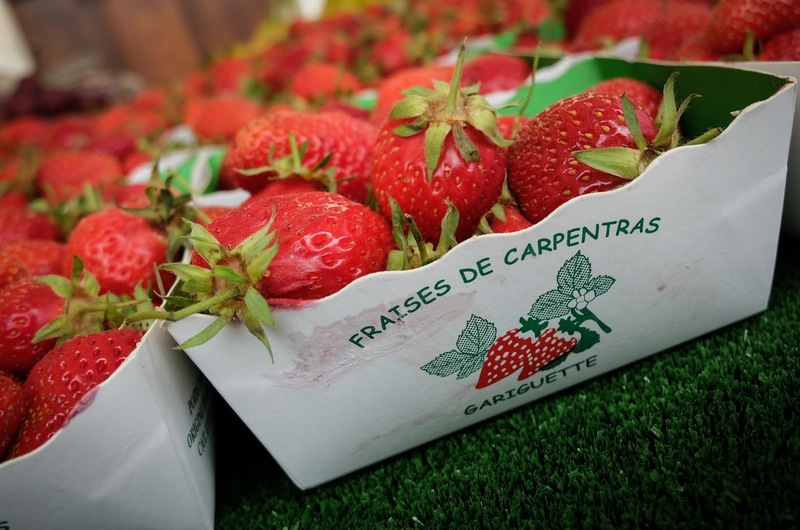 This is also one of the things at the markets that is very reasonably priced (although cheaper still in Avignon itself). As you are wandering round the stalls don’t overlook the town itself. Built on the confluence of three small rivers, the little bridges and rather huge moss covered waterwheels make for a pretty sight. The town is also known for its antiques shops which are there all week round but beware the price tags; as one local put it “priced only for Americans and Parisians” – take from that what you will! On a Sunday in late May the town was already awash with tourists. In August you might want to get there very early indeed. If you’re suffering withdrawal symptoms from your Sunday roast and the aforementioned supermarket is closed then buy one of the rotisserie chickens on offer and some fresh veg and what could be nicer? 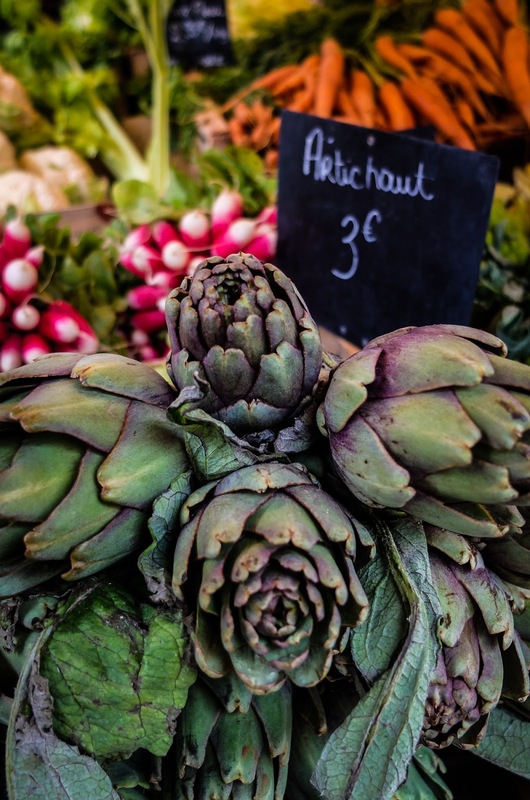 Yes, its pricey, yes, its busy, yes, there is an element of the pastiche to it but L’Isle sur La Sorgue makes for an alternative half day out to wine tasting and following the footsteps of Van Gogh and who doesn’t like a market?